The #Technasium is in full swing with lots of learning going on. Over the past month, the staff has gradually trickled in to learn about various edtech tools; with more coming each day. A few of us have even made it into our own staff room, and have been hanging out there each period we have off. It's provided an environment for collaboration, sharing, planning, and just about everything else we set out to accomplish. However, even if you plan, and plan, and plan, there are still some unforeseen events that may still occur. And that's exactly what we've seen with the #Technasium. As a high school we have plenty of connections with the community around us. Jim realized however, that we also have plenty of connections with our feeder schools (or family of schools). Learning about edtech is not an isolated learning environment, but one where many people need to collaborate, share, explore, plan, and discuss. Whether you are a secondary teacher, or an elementary teacher, learning about effective instructional technology implementation is all the same. 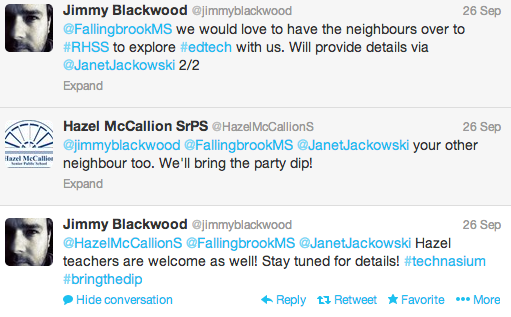 The simple tweet Jim sent established a connection where not only the intermediate school next door jumped on the opportunity, but also one of our elementary schools a number of kilometers away. From this one tweet we've now seen teachers from outside of our school come into the #Technasium to learn about edtech tools with our own staff. It's an environment we could not have foreseen nor planned, but one that we have gladly welcomed. It's still in its infancy, and whether we see more teachers visit the #Technasium is still too early to tell. However, these connections that have established themselves may not have happened previously; and collaboration between a family of schools may not have happened otherwise. It's as simple as that. Provide an environment for teachers to learn, and the result will not just be learning, but connections as well.